Amazon can get its drones ready for take-off. The Federal Aviation Administration (FAA) has finally signed off on the rules regarding commercial drone flights in the U.S., which means companies such as Amazon can begin testing the airborne tech for deliveries and other purposes. However, the regulations are more restrictive than these companies might have liked: as with privately owned models, commercial models must only be flown in the daytime and stay within the line of sight of the operator at all times. Drones and whatever packages they're carrying must weigh less than 55 lbs (that's about 25 kg) and each drone must have its own pilot. These commercially used Unmanned Aerial Vehicles (UAVs) have to stay below 400 feet and cannot fly faster than 100 mph. 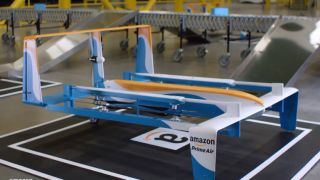 Those restrictions (particularly the line-of-sight one) would seem to put a dampener on Amazon's plans to have delivery drones buzzing all over the country, but the FAA has said companies can apply for waivers if they're able to prove their technology is safe. An online portal for waiver applications is going to be available soon. Unlike private users, commercial pilots will have to pass an aeronautical knowledge exam at an FAA-approved centre, but they won't need a full pilot's licence - a previously enforced restriction that had been criticised for being too limiting. In its own press release the FAA admits this is only a "first step" in regulating commercial drone flights, but at least companies can now get up and running without breaking the law. Additional considerations such as privacy and surveillance will be tackled in future regulation updates, the FAA says.